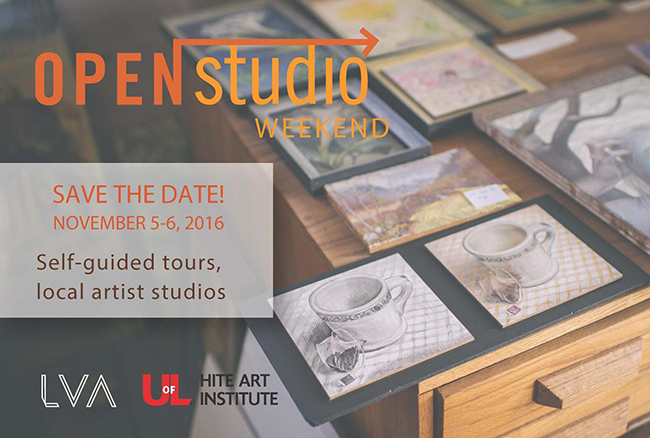 One weekend, each year, artists from all over Louisville open their doors for Open Studio Weekend! And I am one of those artists!! This event is a wonderful opportunity to see artists at work, get a glimpse into their process of making art and add to your local art collection! Open Studio Weekend (OSW) is a partnership of the LVA and University of Louisville’s Hite Art Institute to raise funds for LVA‘s signature program Children’s Fine Art Classes and the Hite Art Institute’s Mary Spencer Nay Scholarship programs. For only $20 you can gain access to artist studios throughout the city, while supporting arts education and scholarship programs. It’s a small way to make a big difference and take part in an exciting and interactive exploration of the local art scene in Louisville! Click this link to purchase your Open Studio Weekend Ticket. You can also purchase at the following locations: Cressman Center for Visual Art, Commonwealth Bank & Trust, Louisville Visual Art, Nitty Gritty, Preston Arts Center, Revelry Gallery Boutique and Silica Ceramic Studio.